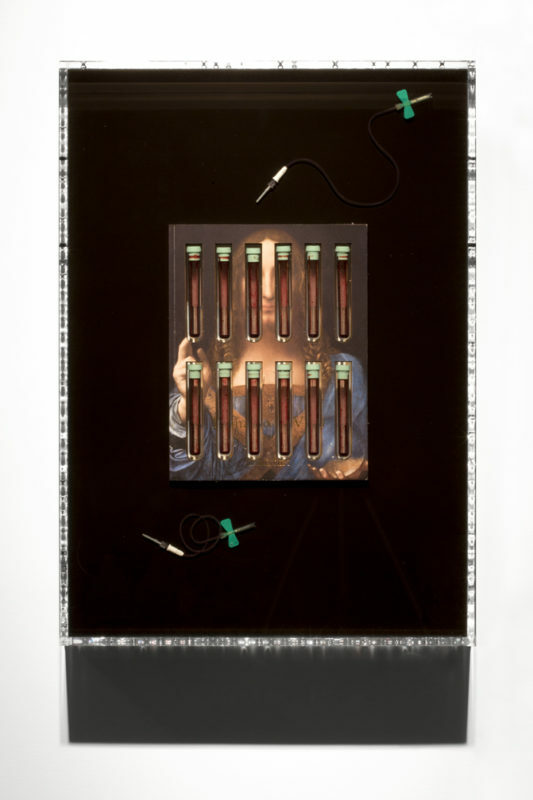 Jordan Eagles, Jesus, Christie’s (detail), 2018, Christie’s sale catalog, medical tubes, needles, and blood; plexiglass and UV resin. Courtesy of the artist. On November 15, 2017, a painting attributed to Renaissance master Leonardo da Vinci, depicting Salvator Mundi—Jesus Christ as “Savior of the World”—sold for $450,300,000 at Christie’s New York, making it the most expensive artwork in history. For New York City-based artist Jordan Eagles, the sale of Salvator Mundi constitutes a point of departure for asking how we, as a society, value objects over human life. Jesus, Christie’s features an original copy of the Christie’s Salvator Mundi sale catalog, laser-cut to accommodate twelve medical tubes that were used for collecting the blood of an HIV+ undetectable long-term survivor and activist. Catalog, tubes, needles and residual blood are encased in high-polished resin, mirroring the dimensions of the sold painting to forge a modern-day reliquary. In creating Jesus, Christie’s, Eagles has considered Jesus as history’s greatest blood donor, following the Christian theological stance that he shed his blood for the deliverance of humankind. The work forces us to question whether Jesus would have wanted $450 million to be spent on a painting of his likeness, or instead dedicated to scientific and medical advancement that could help save lives and alleviate illness.